So, now the fun is done and it’s back to the grind. A shipwright’s work is never finished. The weeks and months ahead hold all sorts of delights. We hauled Iona – cross hauled her with Merrilee II’s launch – and she now sits, redolent of the river, in Richmond boat builders awaiting scraping, painting, re-caulking, remedies to transmission (which has been inoperative since her last haul-out) and some top sides work. She’ll probably need her deck recaulked as well. We’re astounded at the amount of marine growth and the degradation to her paint since her last haul-out about 4 years ago. 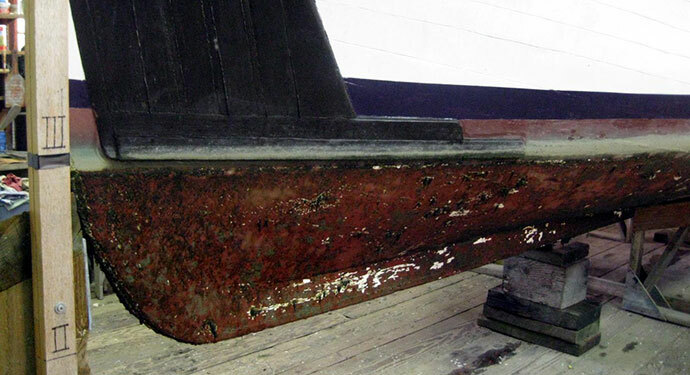 More evidence that a vessel ought to be hauled and her bottom scraped every two years. She’s got way too many soft spots so we can expect her to be in the Boatworks for a year at least. More like two. A complete work list will be drawn up soon. I’ll post it on Iona’s page when I get it. Another project starting, one dear to my heart, is the formative “Britannia Skiff Division.” The Society has a nice collection of skiffs. The large end of the skiff spectrum is held by the Fraser River fishing skiffs, the small end by an 8′ sabot that has been on the bottom of one of the ponds for a few years. (That one may just become a planter.) In between are a half dozen or so pieces in the 9′ to 12′ range. The skiff fleet incudes the delightful little Stumpy, the Daisy and several others. 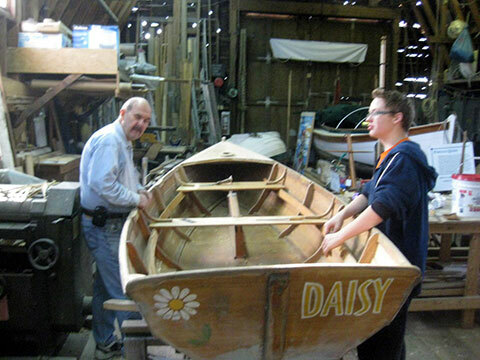 The plan is to use these craft as skill builders for wannabe boat builders and then to [gasp!] sail them around the harbour.